October, by far, my favorite month of the year. Here in Southern California, it is not as dramatically beautiful as other parts of the country. But the gentle cooling in the weather, subtle changes in the shadows, and colors are welcome. I love pulling out my fall decor, visiting Oma’s Pumpkin Patch with my kiddos, putting mounds of colorful pumpkins in my front yard, making carmel apples, and other fall treats. I have created at least a dozen pumpkin paintings over the years. 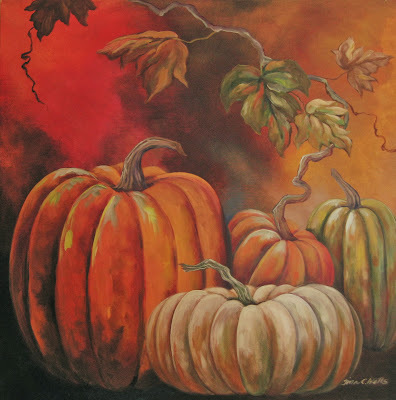 Some have been purchased by clients, some given as gifts, and sometimes, like yesterday, a friend will call and say, “Can I borrow a pumpkin painting for the season?” It makes me happy to have someone enjoying the art in their home. 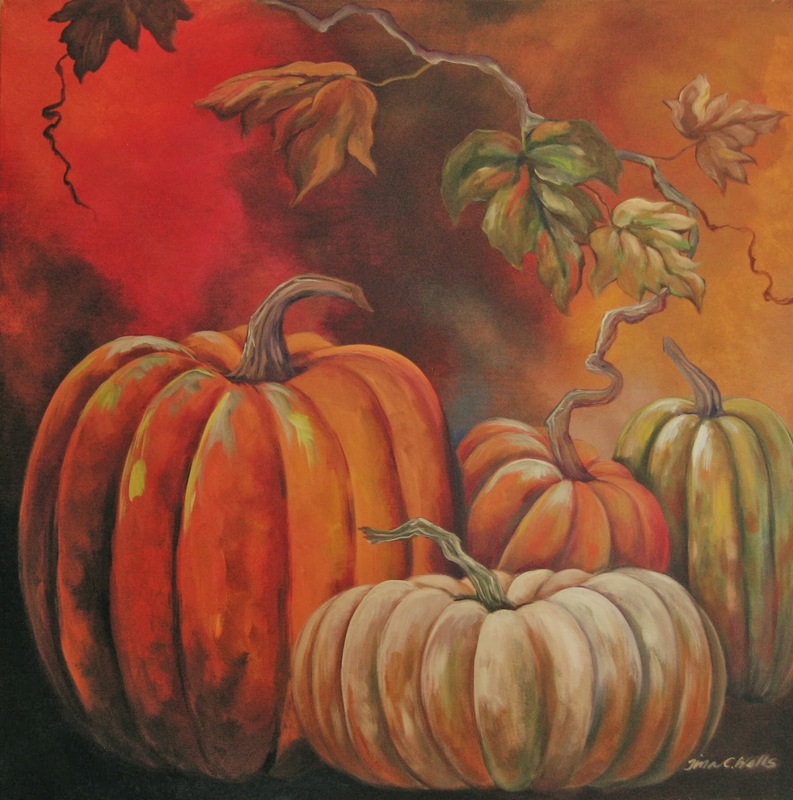 This pumpkin painting is the one I have chosen to hang in my living room this year. It is one of the first I painted, and I have always liked the slightly spooky black and red background. I enjoy Halloween for the fun factor... kids dressed as their favorite character, excitedly running through the neighborhood collecting candy, and enjoying time with friends and neighbors. I can live without gore and horror; so I do up the fun, and skip the scary. We have a fun, safe neighborhood to trick-or-treat in, and always invite friends to join us. The adults have decided to join the costume party as well. It is a great time to build community. Your neighbors are already coming to your house with their kids...so have a mini party in your front yard, perhaps with hot cider. The Bradbury Pumpkins- Love it! Last year, I started a new tradition of making “brew” on the porch for the kids. I mixed up Sprite and pineapple juice with scoops of green sherbet to look swamp-like, set the punch bowl inside a larger container full of dry ice (purchased that day at the grocery store). We placed it on the porch and the kids came out to watch as I added water to the dry ice making it smoke. Then, I ladled out the brew to a line of costumed cuties. Halloween afternoon is busy with getting the kids ready in their costumes. This year I am making the main dish for dinner ahead, so that it is one less thing I have to do. This is an easy, make-ahead crowd pleaser. Bake in preheated 350 degree oven 30-45 minutes covered. Cook 10 more minutes uncovered. My boy turns 10 tomorrow!!! Happy Birthday, Kenny! Love that boy!